I've finally found her. After several failed attempts of seeing her, yesterday was successful. I had to wait but it was definitely worth it. The reason I left my previous OB is because she did not keep a record of my visits. I did not expect her to remember by heart every detail of my consultation but at least do something about it. She did not remember that we discussed my miscarriage. Duh! Anyway, I went to my new OB yesterday and I was not disappointed with the feedback I have been hearing about her. She told me to be comfortable with her. She explained everything in layman's terms. Empathizing with my miscarriage is a plus. Her empathizing makes us to be on the same frequency otherwise we will not work out according to her. 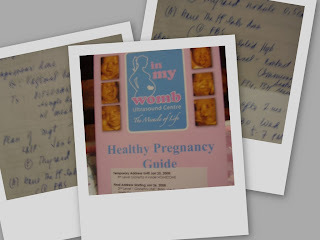 What I love the most is that, she gave a pre natal notebook (though I am not pregnant yet) to keep track of my visits and the things that we will be doing (which is a long list)until I give birth. What scares is me is the APAS test. Like I said from my previous post, treatment is expensive. My goal is to take the APAS test in a month. In the meantime, I have to shoo away this nasty yeast in me. Hate em! I hope your APAS result will be negative, I'll include you in my prayers.